All of us have hobbies, for some it’s rugby for others it’s watching the latest Breaking Bad box set back to back. Me, I have many hobbies. Music, football, reading and building things are the ones that stand out most. Like most I don’t always get to do my hobbies every day of the week. But since I’m not the type interested in sitting down and watching TV, I usually end up building something to keep my brain alive. By building, I mean apps, websites etc etc. I also like to go to https://imhighroller.com/ and play online casino games in my spare time. So when my son, who was an inquisitive 1 year old at the time, got hold of my phone and started suggesting apps I download for him to be entertained, I knew I could build a simple app tailored specifically for his age that would keep him entertained and at the same time teach him a thing or two. At the time I was keen to learn how to develop Windows Store apps, so I set myself the task of building an app just for him. A year has past now since I started the process of creating this app – a year on, the app has been downloaded over 25,000 times from the Windows App Store and has turned into a mini business selling in-app content for those who wish to download the app. In the past week – I’ve completed the porting of the app to Android and is now available in the Play Store. It’s amazing what you can do in your spare time when you put your mind to it…. and stop watching TV!!! The app is basic, but it achieves what it was set out to do. It’s aimed specifically at Babies / Toddlers aged between 6mths and 3 years old. 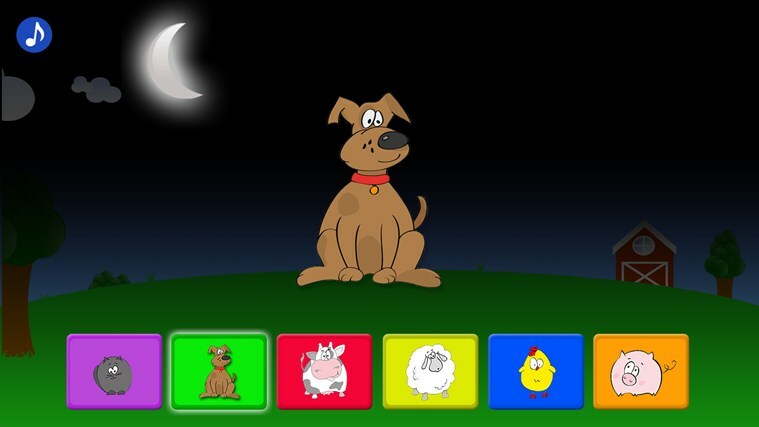 Your child can engage with the app by clicking the animals and hearing the sound they make. After observing a number of children using the app, it’s clear that they find it fun and they learn at the same time. So go ahead download it today and leave a rating – it would be very much appreciated!